By Friday evening I was desperate for a break. I arrived home and really didn’t feel like going out again – I just wanted to go to bed, but I had a yoga class scheduled, so I had to make myself go out. We did a variety of poses, including spending some time in tree pose. We also worked on camel pose (ustrasana). Fortunately, the hour of relaxation did me good and also gave Stu an hour of peace and quiet… however, I still wanted to go to bed early. 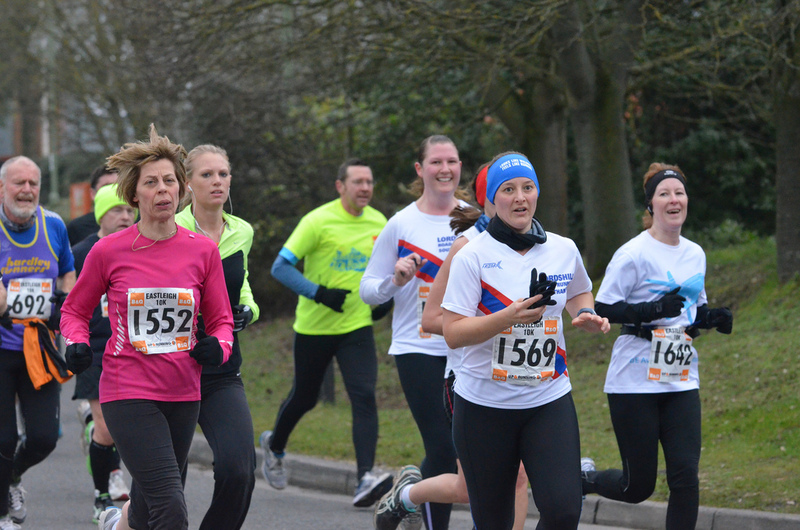 On Saturday morning, I decided to do parkrun with Ellie. I focussed on keeping my cadence high (94) and didn’t check my time at all, so was quite disappointed that I finished in 26:42. 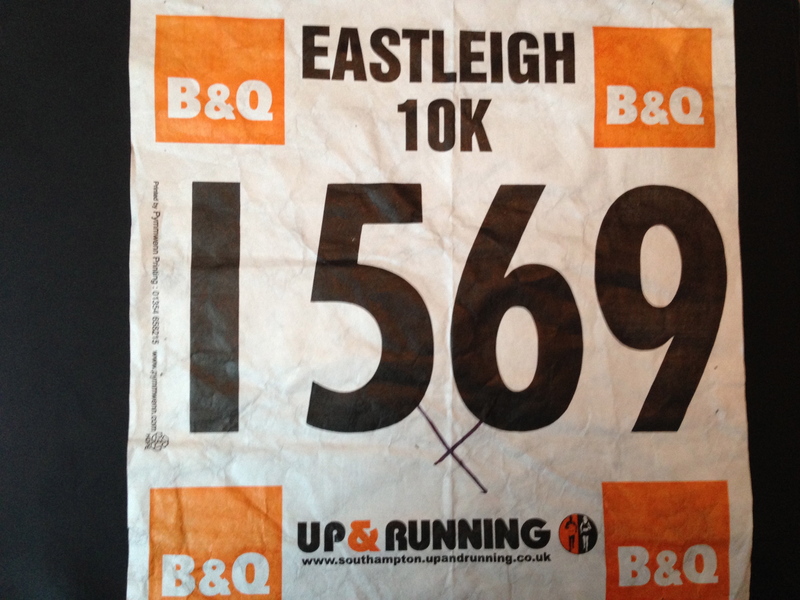 It felt really tough, but it’s probably just as well as I knew I had to do Eastleigh 10k on the following day. 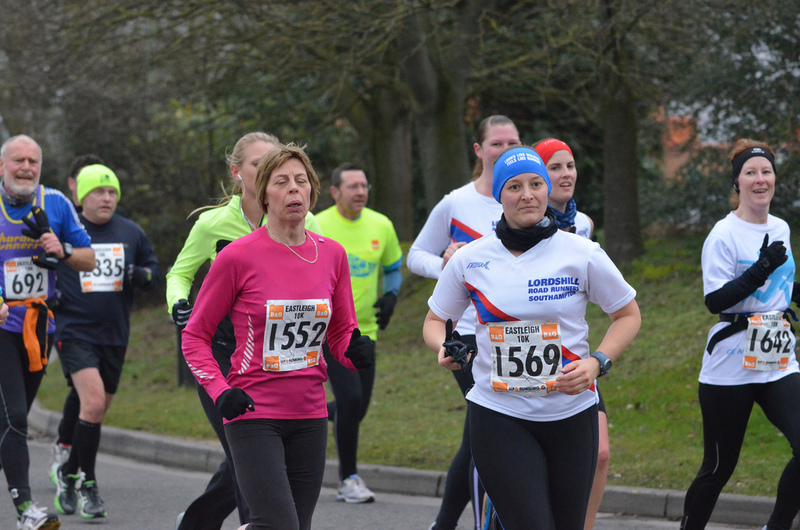 Usually, I spend time chatting to other runners after parkrun and head to The Hawthorns cafe for a drink, but I had to make a quick getaway on Saturday as I had a sports massage booked with Pete at You Massage Therapy. It was a good massage although Pete discovered muscles that I didn’t know I had!!! I would love to be able to have a sports massage every week. 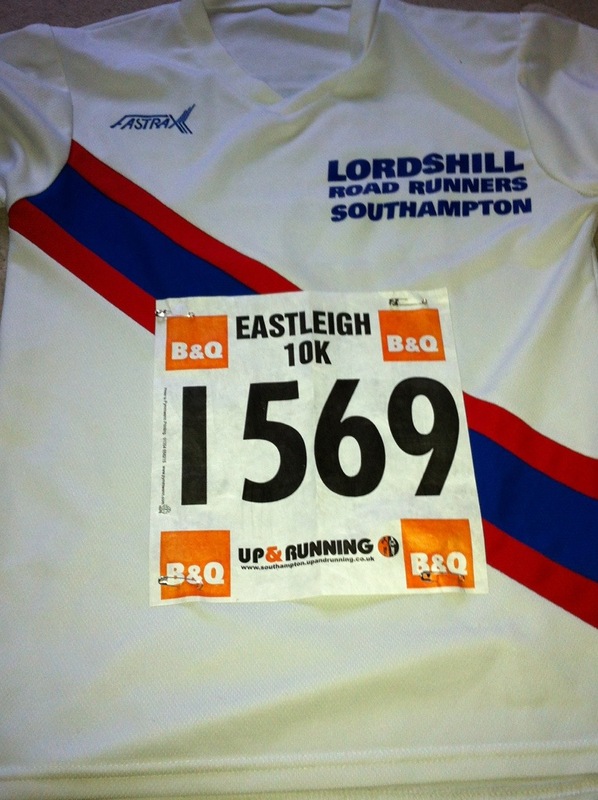 It was nice to almost have a lie in on Sunday morning, as Eastleigh 10k is one of the most local races that I can do. Also, Stu and I weren’t giving anyone a lift, so we didn’t have to allow time to pick anyone up. We arrived early enough to park in the leisure centre car park and then went in to collect our t-shirts. I had noticed people carrying fluorescent yellow t-shirts out of the leisure centre and so I assumed that they were technical t-shirts, but it quickly became obvious that they were just cotton t-shirts 🙁 I guess that at least a t-shirt is more useful than a medal. I met up with my running buddy Irene and her parents who had come over from Spain to take part in the race. Her dad was aiming to do sub 50 minutes and her mum ran 55 minutes in her last 10k (which was actually 11k long, because it was in Spain, but that’s another story!) I didn’t genuinely think we would beat Irene’s dad, but I suddenly realised that her mum could be serious competition – eek! I went to put my belongings in the car and agreed to meet other LRR runners who were aiming for 50 minutes by the 50 minute start marker. 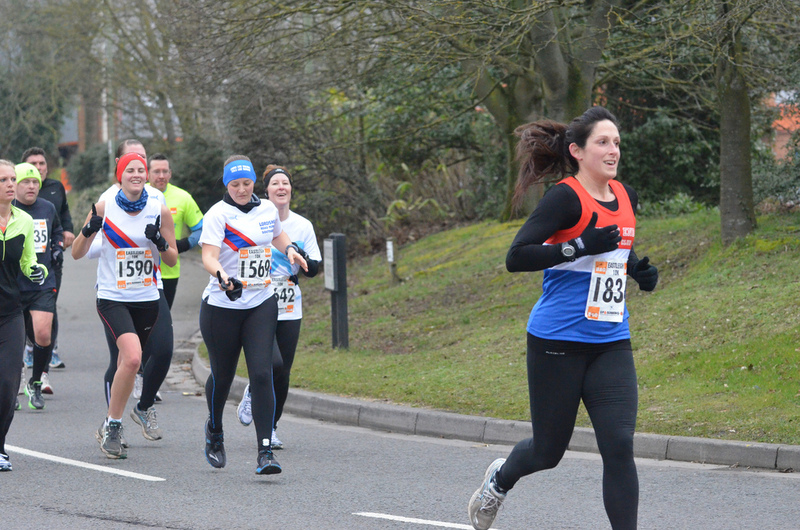 When I got to the start marker, James was already there and Kirsty and Laura joined us. Soon afterwards Irene arrived. The start of the race was very busy as it’s so popular, and it didn’t help that some people had wildly overestimated their times and were barely jogging within the first 500m. 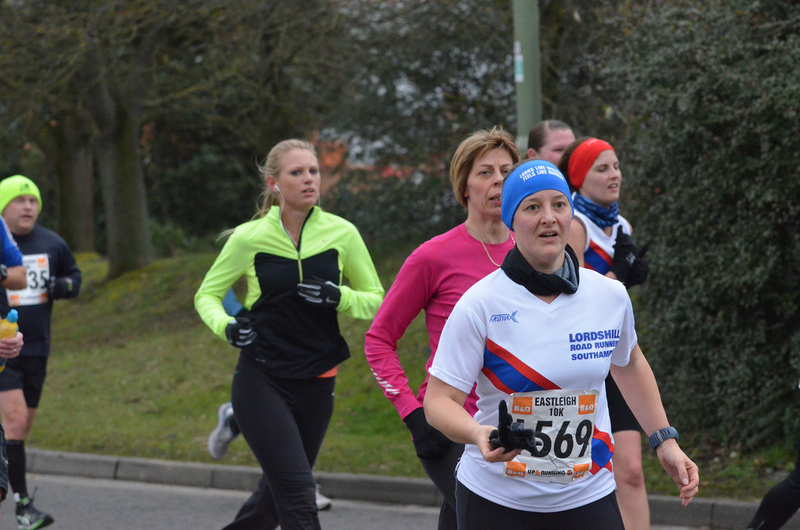 It took a few minutes to cross the start line and the opening kilometre was very congested, so I wasn’t able to hit my target pace of 5:07/km. I felt quite comfortable running at what I thought was a good pace, but had to try to avoid conversation as friends kept asking me questions. 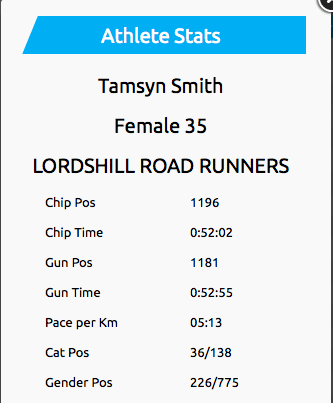 I had checked with my favourite age graded race predictor what it thought I could do at Eastleigh based on my recent parkrun PB; it suggested 52:56. 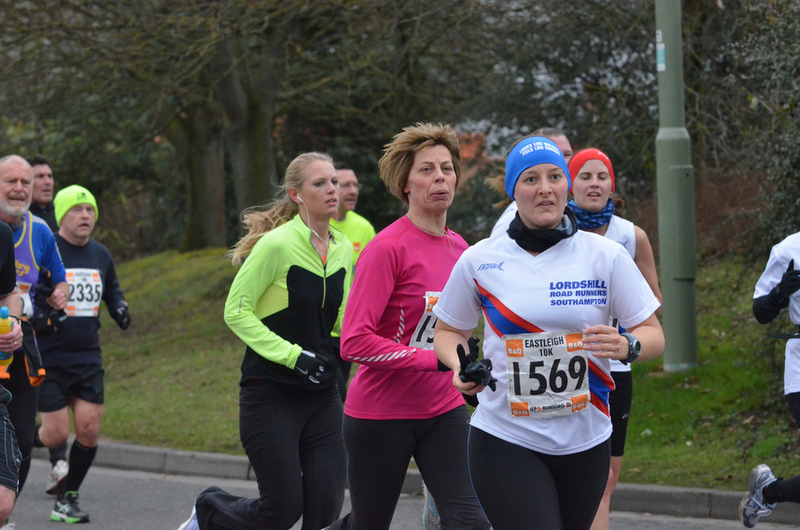 We kept going and I suddenly realised at 8km that I was feeling pretty good and that I thought I could up the pace. 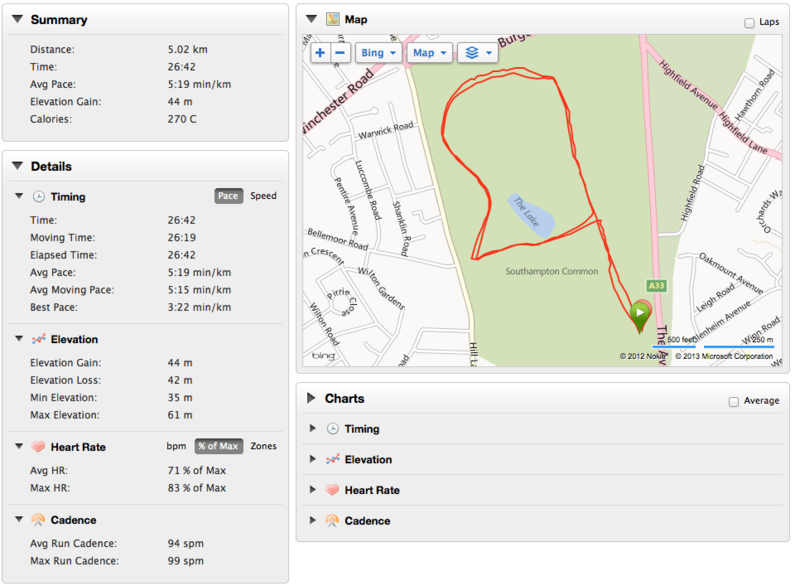 I started pushing on and managed to hit 3:53/km at one point during that kilometre. 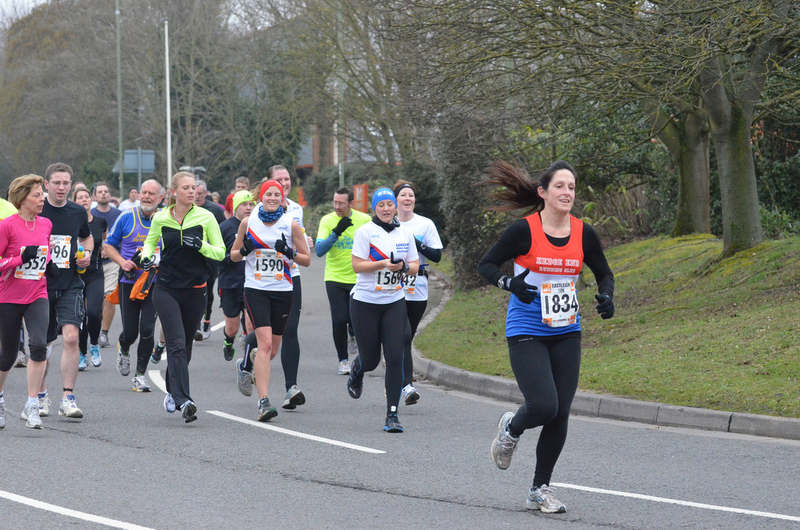 The final kilometre of the race is deceptive. It’s easy to see the leisure centre, but the path feels like it goes on forever. Also there was a particularly cold wind blowing into my face. 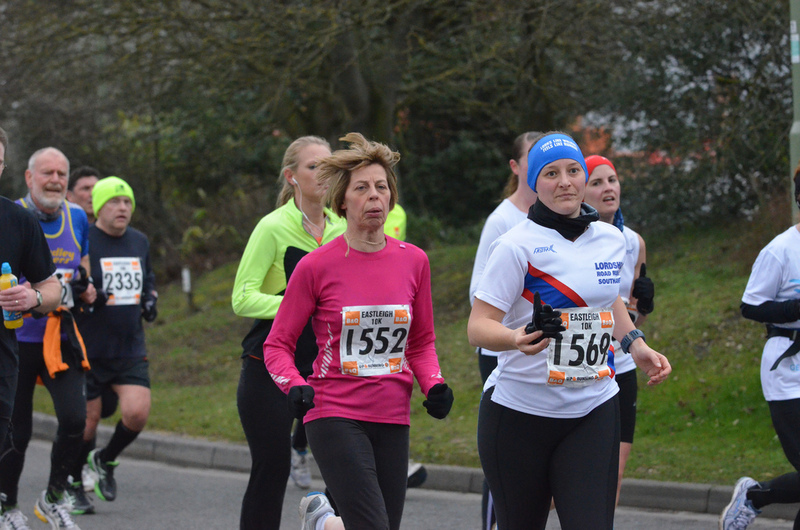 As I got to the final 100m, one of my club mates managed to sprint past, but I didn’t have enough energy for a sprint. I stopped my watch on the line and was surprised by how well I’d done: 52:02. 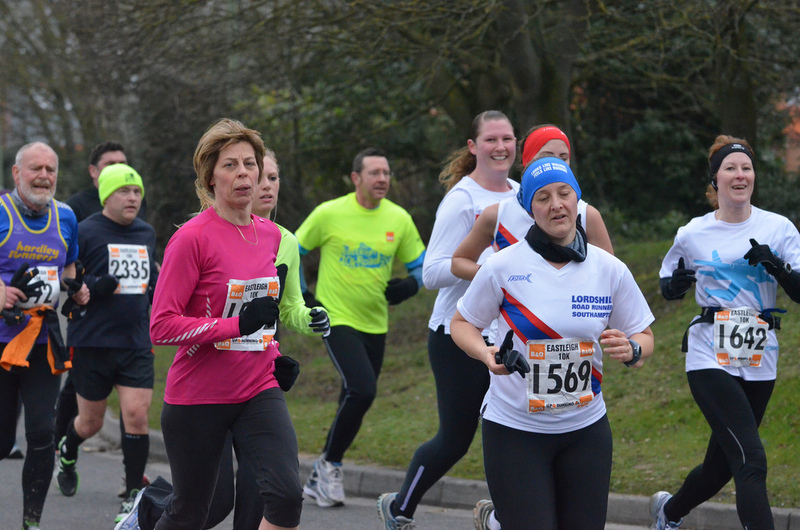 If I’d realised that I had any hope of going under 53 minutes, I would have pushed much earlier in the race – grrr! 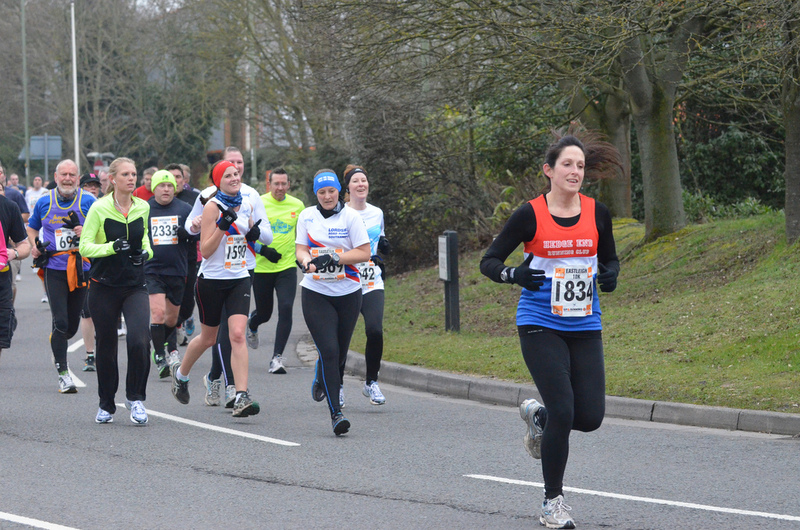 I then stopped to cheer others in before collecting my water, banana and slice of home-made cake. Stuart had decided to jog the course as he has a leg injury and has been suffering form a heavy cold all week. He completed the course in just under 40 minutes! I’d love to be able to ‘jog’ like that!!! Unfortunately, I think I stopped for just a little too long as by the time I got over to Stuart, I was shaking with the cold and had lost the feeling in my hands. 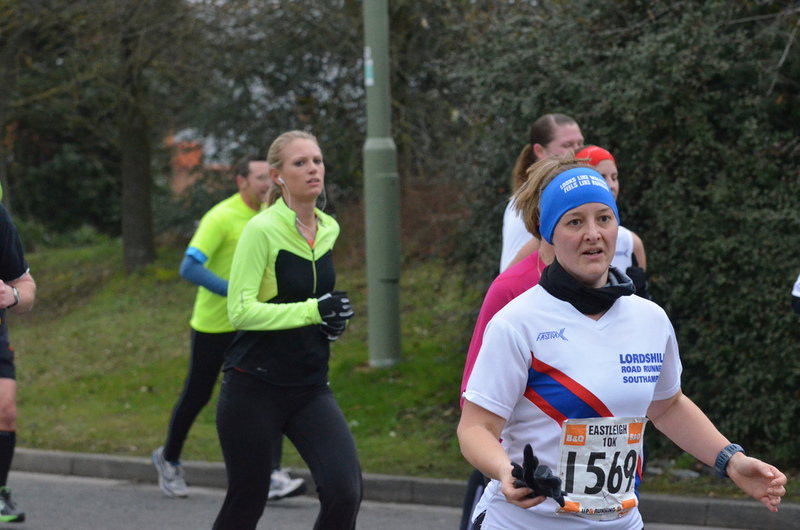 I managed to find Roger to retrieve my gloves and then rounded up Kirsty to run 12.5km home. In the evening, I had the final of my series of five swimming lessons. I explained to the instructor the problems that I have been having with front crawl – I can’t breathe out enough to be able to breathe in properly and he suddenly had a great idea – instead of doing 3 strokes per breathe, I should try 5 strokes. It was a revelation and I was magically able to complete a length without getting out of breath… however, even that couldn’t help me forever. I managed to do two lengths non-stop for the first time. Then the instructor asked us to do four lengths non-stop, but I knew when I was defeated, so I took a breather after two. We then had to do a medley of backstroke, breast stroke and front crawl, which was much easier. Overall, I feel I’ve made loads of progress and am so glad that I signed up for the lessons. I’ve already signed up for the next series, but Victoria won’t be doing them as she will be away for several Sundays. What do you think? Would you be tempted to enter? I made plans so that I was able to get up on Monday to finally do my 400m time trial. I arrived at the pool and waited until the clock said exactly 8:15 before I started. I’m not strong enough and fit enough yet to be able to swim length after length without a break, but I wanted to see how long it would take me including breaks. The only length that wasn’t very good (i.e. I did two strokes with my head out of the water) was my 16th length. It took me 17 minutes and 17 seconds, so I’m clearly not going to trouble any elite athletes (the women’s world record is 3:59!!!) but at least I have something to judge my efforts by now. Monday’s tips included: “Don’t worry if you feel a little bit sick to the stomach during the second half of the race and if you have a hard time refreshing yourself. This sensation, which is certainly disagreeable, is common during a marathon.” Bizarrely, the refreshment stations include dried fruit, which is not what I would want to eat during an endurance race. On Monday evening, I went to LRR training, which was a ‘mix it up’ session. Irene and I took groups A and A* for a circuits session with some running drills and exercises such as squats. We received some positive feedback and I hope that some people will move up a group for the next training series.